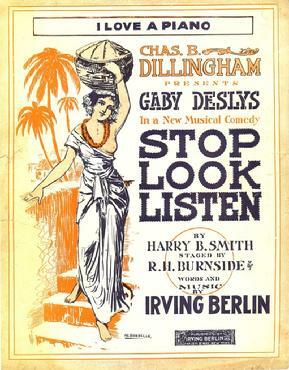 “I Love A Piano” was one of Berlin’s ragtime style songs. It was introduced in the 1915 Broadway musical Stop! Look! Listen!, where is was sung by Harry Fox. It as recorded in 1915 by Billy Murray, but did not catch on immediately, due in part, I’m sure, to the fact that home phonographs may not have been as prevalent as they were a few decades later. Berlin included it in the 1948 movie Easter Parade with Fred Astaire and Judy Garland and since then the song has been well-recieved. “I Love A Piano” was recorded and televised live on April 12, 1994 on MTV. The MTV Unplugged album was released in June of that year. The songs from the televised concert were arranged by Tony Bennett and the Ralph Sharon Trio.